Standard Gutters, Premier SnapLock Gutters 10X Stronger Than Standard Gutters. 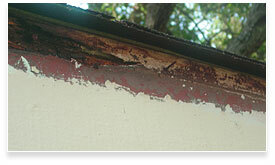 ​No Holes in Your Fascia Board or Roof, Lifetime Guarantee. Never Buy Gutters Again! MasterShield keeps your rain gutters free from pine needles, leaves, maple seeds (helicopters), animal nests, shingle grit and oil at a rate 10-times higher than outdated filtration systems used by other leaf guards. Our micro mesh gutter guards are constructed of high quality aluminum and surgical-grade stainless steel, and are strong enough to hold up to four feet of snow or 20 pounds of debris! Even under that impressive amount of weight, your gutters, fascia and siding will last longer than with other gutter screens. MasterShield is recommended by Tim Carter of AsktheBuilder.com and has been highly reviewed in leading home improvement publications. If you’re familiar with snow, melting and freezing ice, MasterShield also offers heated gutter guards that stop icicles and ice dams before they start. Think about safety! Self-cleaning gutter covers save you time on home maintenance and keep you and your loved ones off high, wobbly ladders for good. MasterShield leaf guards are the first to fit the exact pitch of your roof and will not void the warranty on your shingles. Proactively investing in MasterShield gutter protection means you won’t have to react with your wallet later on roofing or foundation repairs. MasterShield helps protect your home by filtering water away from your foundation, giving you peace of mind and an environmentally friendly tool for collecting rainwater. AN EQUALLY INNOVATIVE WARRANTY PROMISE FROM MASTERSHIELD MasterShield utilizes the latest advancements in the industry and we strive to beat our own standards with every product generation. We are so confident you’ll be satisfied with our gutter guards that we’ve developed the best warranty in the industry. If any professionally installed MasterShield gutter guard clogs, we’ll replace it or refund the original product cost. MasterShield’s warranty is also transferable, making leaf gutter guards a valuable home improvement that provide real equity. Learn why our gutter guards are made differently, perform better than the competition, and why each feature has a unique purpose. Test how our gutter protection system performs with leaves and other debris from trees in your own yard. Find out answers to other common questions about MasterShield and how the gutter guard system is installed. Estimates are fast, easy and pressure-free. Dealers provide essential details on pricing, features and materials, along with what makes MasterShield the best solution for clogged gutters. It’s Safe: Don’t risk climbing ladders to clean your gutters and downspouts! Put the LeafLock Gutter Protection System™ to work for you. Cleaning gutters is dangerous work. Each year tens of thousands of people are injured with ladder related injuries. The LeafLock Gutter Protection System™ will maintain clean, free-flowing gutters and eliminate dangerous and wasted time spent on ladders and the associated risks involved. Besides keeping you off the ladder, the LeafLock Gutter Protection System™ puts a halt to expensive damage to your home as a direct result of needed repairs caused by clogged gutters. Clogged gutters can and will cause expensive and severe damage to your home such as: rotting fascia boards, water damage to interior walls and ceilings, mold and mildew and, of course, erosion to your home foundation and landscape. Clogged gutters are the number one cause of wet and moldy basements. This will lead to extensive damage, such as cracked and damaged foundations. It's Durable: When you put the bracket in your hand, you will immediately know it is strong. Ask your sales representative to stand on it and watch as it does not give at all. Please do not attempt to do this with any competitor’s bracket! The exclusive 1/8” thick extruded hanger and bracket system will amaze you and you will be convinced that this is the strongest and best system available. By using only the strongest and longest lasting materials along with our no-holes LeafLock Gutter Installation, your gutters will keep doing their job for the life of your home. We use a Kynar® coating which is the best exterior metal coating available anywhere! 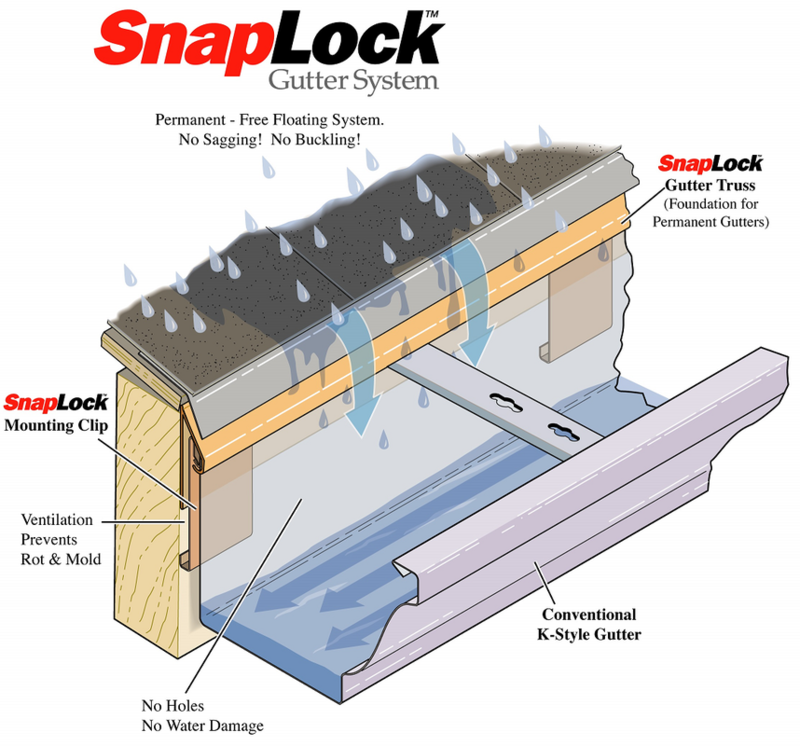 The SnapLock Gutter System® eliminates failures due to water damage typically associated with conventional gutter installations. SnapLock’s innovative “No-hole” technology uses no spikes or nails for attachment to your roofline. There is not need to penetrate the front or back of the gutter. The result is a watertight mating of the gutter at the edge of your roof – a seal that prevents seepage, rust, rot and mold. Further, because the integrity of your gutter channel is not riddled with holes, the SnapLock Gutter System dramatically outlasts traditional rain gutters while protecting your home against the hazards associated with bacterial mold and fungus. Call 919 621 7471 For a Free Local Estimate In Most Areas. ​Receive Our Brochures By Using "The Receive Your Electronic Brochure Now Form"
It Works: It works because we use the only patented extruded gutter hanger and bracket system available which automatically guarantees the nose-forward position. This causes leaves, pine needles, and all other debris to fall to the ground and allows your gutter system to channel water away from your home forever. The bracket also permanently eliminates any front-to-back movement of the LeafLock panel for the life of your home which keeps your system working correctly. The LeafLock hanger & bracket system is the only free-floating system available that allows the panels to adjust to changing temperature which eliminates buckling and warping of the panels! Click the video below to watch the water display! It's Guaranteed. 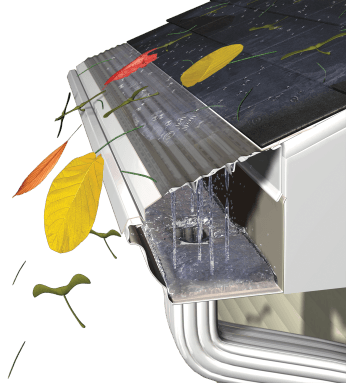 The LeafLock Gutter System™ is guaranteed not to clog for the lifetime of the home! This guarantee transfers with the home, and unlike most competitors “small print” on their warranty, there is NO disqualifying method or cost to transfer the warranty. There is no pro-rating of anything with our warranty. Read the competitors’ warranty! This is the strongest warranty in the business. Click Here For The LeafLock Warranty! It's Affordable. Because Leaflock gives you options, you are able to choose one that fits your budget. It’s not all or nothing. If your gutters are in good condition, LeafLock clog free gutter covers don't force you to buy new gutters or throw your good gutters away, which can save you thousands of dollars. Remember, we add our patented extruded gutter hanger on EVERY job, which makes your gutters stronger than ever before.